El Shaddai: Ascension of the Metatron was an action game released in 2011, but the demise of developer Ignition made any direct follow-up unlikely. 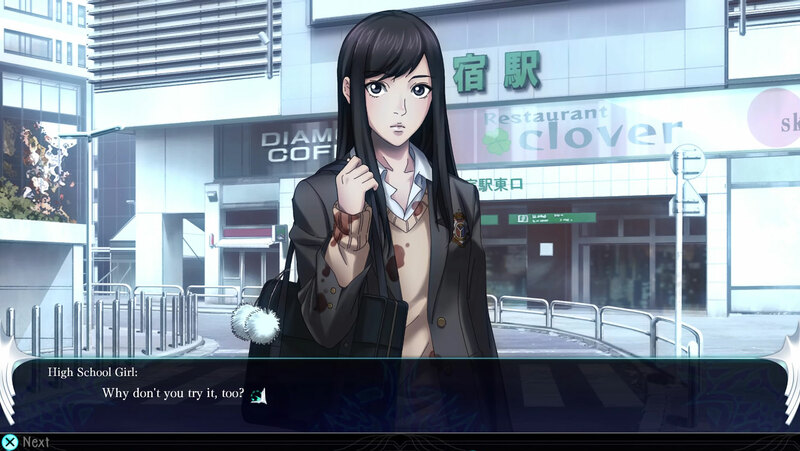 However, some of its senior development staff joined up with Kadokawa Games and made The Lost Child, somewhat of a spin-off that takes the form of a dungeon-crawling RPG and shares many of the mythological aspects as well as a few more direct connections. Despite obvious parallels to Atlus’ Shin Megami Tensei series, The Lost Child does more than enough to differentiate itself and stand on its own merits, providing an engaging dungeon-crawler, albeit with a few drawbacks that prevent it from reaching the very top. Knowledge of El Shaddai will provide some callbacks to players but is not at all necessary for The Lost Child. Players control a young man named Hayato, who works for a paranormal magazine named LOST. While investigating a spate of suspicious suicides, he comes across a woman named Balucia who gives him a device called the Gangour before running off. Returning to his office, Hayato comes across a young woman in strange clothes named Lua. Lua claims to be an angel, sent down from Heaven to guide Hayato — the Chosen One — in using the Gangour to capture the spirits (Astrals) of demons trying to take over the mortal world. In added intrigue, Lua also turns out to be Balucia’s sister. The vast majority of The Lost Child is spent dungeon-crawling through parallel dimensions known as Layers that appear across Japan. Hayato and Lua are capable fighters in their own right, but are aided by summoned Astrals of supernatural beings captured by the Gangour. The two are joined by up to three Astrals in the active party, with an additional six on the sidelines ready to be subbed in during battle, plus an unlimited number kept in reserve — though moving Astrals from the reserves to the active or sub party uses up part of the Gangour’s battery. Astrals are divided into three types — Angels, Fallen Angels, and Demons — and five elements that follow a circular effectiveness cycle (fire Astrals are weak to water, etc.). Capturing Astrals is done using an Astral Burst, a special attack that combines the three summoned Astrals with a special bullet. 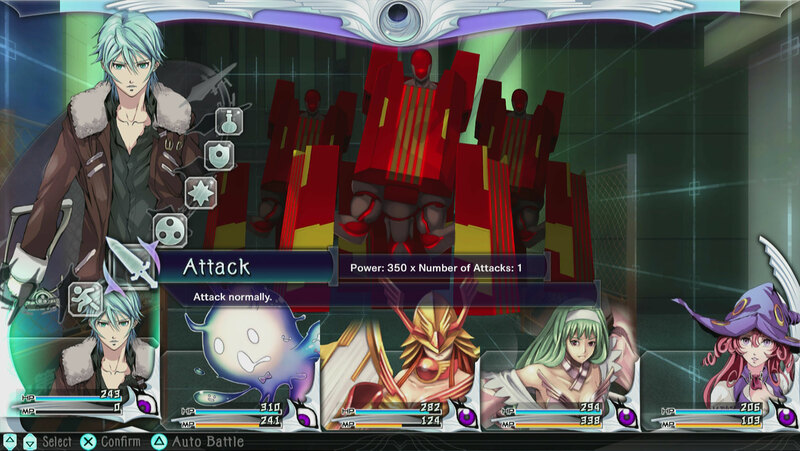 Outside of some story battles, players need to defeat the enemy using the Astral Burst for it to be captured. Only one Astral of each “species” can be held at once, future captures are simply defeated. The Astral Burst’s power is determined by a mixture of the bullet selected — many bullets enhancing a particular element or providing additional bonuses in combat — the Astrals currently summoned, and the fullness of the Burst gauge at the top of the combat screen. The Burst gauge is filled by damaging enemies, but if it overflows then players will not be able to use the Burst on the next turn and it will reset to zero on the following one, adding a bit of extra risk-versus-reward. Quite why half the nameless NPCs are spattered with what looks like blood remains a mystery, at least until a throwaway line near the end. While Hayato and Lua collect standard experience, with level ups granting five points to spend upgrading attributes, leveling up Astrals requires spending Karma. Karma is mostly granted through combat, though there are a few other ways to obtain it, and comes in three flavours — good, dual, and evil — which correspond to Angels, Fallen Angels, and Demons respectively. Karma effectively works exactly the same as experience, but players can freely store it up and dole it out to whichever Astrals they deem fit. Almost all Astrals can also take three forms; they start off in one form but will soon reach a maximum level. At this point, players can take them to an NPC to EVILve them, after which their level returns to one but they will be stronger, with a new evolved design to boot. Players can also reset an Astral, putting it back into its first form, but with a large boost to its base stats. Another unique element The Lost Child brings is its approach to learning new skills. Instead of being awarded as part of leveling up, skills are semi-randomly learnt in combat through the Gangour’s “Fruits of Wisdom” app. This means that Astrals used in combat will attain a wide variety of skills, while those left on the sidelines will just have the small selection they were captured with. There is an option to transfer skills from one Astral to another, but while the Karma system lets Astrals in reserve keep up levels with the main party as desired, using them in battle will allow for them to attain the most abilities. Outside of the Astral Burst and unique elements around the Astrals, The Lost Child uses a fairly standard turn-based combat system. Each non-boss combatant gets one action per turn, the order generally determined by individual speed ratings. Hayato and Lua also have access to standard equipment options, though it’s made a bit more interesting through random OOPArts that are dropped by enemies, which can provide some very powerful options — sometimes with intriguing trade-offs — once appraised by an NPC. Each party member also has an eye to the bottom-right of their portrait that indicates the enemy’s somewhat manipulable hostility to them; the more open an eye is, the more likely it is that member is attacked. The difficulty balance, and option to freely change between three levels, is appreciated. Provided players have an adequately leveled party on normal difficulty, most regular battles can be swiftly dealt with simply by using the auto-battle function, though there will be some enemies — particularly those with powerful party-wide attacks — that require some attention. Bosses, on the other hand, will require players to consider their actions, use skills, make sensible use of the Burst gauge, and keep healers ready to go. Though they will have multiple attacks, and usually gain more as they are damaged, boss fights never seem unfair, rewarding players for planning their moves, and do a great job of showcasing the deeper parts of the combat system. Most dungeons feature two bosses, the first acting almost as a DPS check to let players know if they will be ready for the main event. Automated attacks are usually more than enough to deal with most automated-looking enemies, but overall the balance works very well. The primary issue with The Lost Child‘s gameplay is simply that dungeons drag on a bit too much. The exploration, puzzles, and layouts are generally enjoyable to experience, but nearly every Layer feels like it could’ve either ended a floor earlier or had each floor slightly shortened. It’s not helped by a distinct lack of variety within each dungeon; every floor looks almost identical to the last. Thankfully, there is an auto-move feature and adjustable movement speed, so traipsing back and forth isn’t as annoying as it might’ve been. Fortunately, combat remains highly effective throughout the game, and its quick pacing helps to ensure that, even though dungeons are lengthy, random encounters don’t add more to it than is strictly necessary and don’t leave players stuck having to remember where exactly they were in their explorations. Meanwhile, all of the options for capturing and raising Astrals make the experience related to them both enjoyable and engaging; there’s a nice sense of accomplishment in both capturing new Astrals and in EVILving them into new forms, and there’s a large number to both fight and collect. The Lost Child’s story does a good job in giving players tasks to do and moving things on from one dungeon to the next. Hayato is generally a silent protagonist, though players are given the opportunity to respond at various points. These decisions don’t affect the story, instead simply giving a bonus of additional Karma depending on which response was given. Fortunately, Lua has enough character to cover Hayato’s general lack of it and enable the pair to seem like they make for an effective and willing partnership. The main issue with the story is that it does a poor job in explaining what exactly is happening on the macro level. There are lots of machinations at play across the various pantheons and sides, but it is never adequately explained what they are really trying to achieve and how their actions are likely to bring about fairly nebulous goals. A lot of the questions are answered at the very end, but it’s not at all clear how things get to that point. While the cast is engaging and all of the story beats are intriguing, The Lost Child just doesn’t use them as effectively as it could have. The voice acting isn’t omnipresent, but it’s there for most of the important scenes and strong throughout, while the music provides a decent backing to everything. Visuals are mixed; character and Astrals designs are great, if sometimes rather different to what one may expect for the entities represented, and it’s neat to see how they upgrade when EVILved. However, dungeons are often lacking spark, and floors in individual dungeons all look the same, partly contributing to the feeling of them dragging on. Battle effects are fairly basic, but convey the action nicely and keep it moving along at a good pace. Those with any passing interest in dungeon crawlers should find a lot of enjoy in The Lost Child, though it’s certainly not perfect. Some may be tempted to write it off as an SMT knock-off, but this doesn’t strike as being fair given how its systems go a long way to stamping its own mark on everything and to make it stand out. Gameplay and the narrative both work well for the most part, though certain aspects could’ve benefitted greatly from just a little more polish. The Lost Child is a game that should find plenty of fans out there. Just finished this game. It was entertaining but a few gameplay decisions left me puzzled. The most important one was the random OOPArts items that basically make the normal items you find obsolete. Maybe I was lucky but I got some items that were so incredibly more powerful than anything I looted for the next 20 levels. Like I got a bow that shot twice for 75 damage and petrified while the items I was getting in chests were a gun that did 20 damage with no effects, or a piece of armor with 70 protection and bonus to damage and resistance to an element, when what I got from chests was 20 armor with no bonuses. It almost felt like they added the system after the game was done without considering balance. I did like that I could finish the game on normal without grinding (other than fighting the random battles while clearing the maps). I even used the lowering random battle items a lot when doing puzzle areas. In the end most of the damage came from the astrals anyway and there was more than plenty to level them up (I think I finished with my characters at level 39 or something while the astrals were around 50). Yeah I was about the same, perhaps a couple of levels higher. Also had the fortune to get a decently overpowered OOPArt earlier on that helped rather. OOPArts can be wildly random and I think they definitely make or break to some extent how useful the human characters are. I didn’t have much luck finding good weapons for Hayato (at least compared to some friends playing on Twitter) but I picked up an early staff with +Enchant that attacked the entire front row for Lua, which was pretty amazing. I also managed to find a Null Seal accessory for her about the time bosses started casting mass Seal spells. Near the end of the game I was getting some really nice pieces, but they all had high -HP values (like, -80 or worse) so they went straight to the vendor. The system is neat, but definitely needs some tweaking if it shows up in future games. I ended up finishing the game with Hayato and Lua at 45 and my main 3 demons around 75, probably because I was constantly using the baths and I got stuck on a couple puzzles so I did more combat than would be expected just doing a straight run of the dungeons. Thanks for the review, definitely went straight to my wishlist!